Never Too Old to Serve - Go Navy Go! Like daughter, like dad. 27-year-old Ensign Laura Krause inspired her father to join the Naval Reserves. They’ve always been close. They used to enjoy hanging out together watching their favorite sports. They climbed Mount Kilimanjaro together. And, it seems, he’s been thinking about following his daughter into the Navy since she joined up in 2015. The father/daughter connection isn’t the end of the story. 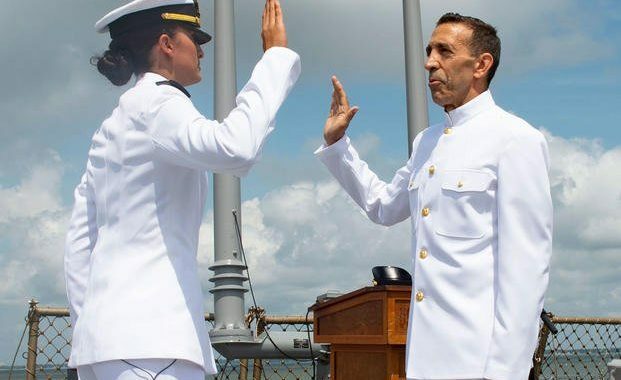 Laura commissioned her dad into the Navy aboard her ship, the USS Ramage, an Arleigh Burke-class guided missile destroyer, on July 13, 2018. After the ceremony, her dad became Commander Tyrone Krause and offered his first salute to his own daughter. CDR Krause is a successful heart surgeon from New Jersey and is 63 years old. He needed a special waiver to join the Navy since he was past the typical cutoff age. So, instead of retiring, CDR Krause is starting a second career, giving back to the military and strengthening his bond with his daughter. This story is unusual, but not unique. For example, back in 2007, Bill Krissoff joined the Navy as a 61-year-old physician. He was inspired to enlist after learning of his oldest son’s death in Iraq. His son, Nathan, was a Marine, and Navy doctors tend to wounded Marines. There’s an interesting twist to this story too. Dr. Krissoff’s (now CDR Krissoff’s) application didn’t seem to be going anywhere until he and his wife were invited by President Bush to attend an event for parents of fallen soldiers. After the President spoke, he asked the audience if there was anything he could do for them. Bill spoke up, and a few days later he got a call from the Navy. I’d like to thank both CDR Krause and Dr. Krissoff for their service.